I know, another Forum. We have many Forum Spots, but not a general one. We can talk at this Forum in general about CM, the characters, what you like, not like. Or just have a chat with a CM Fan. 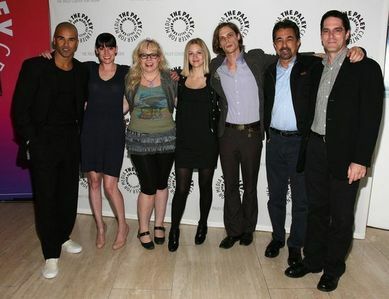 That picture of the CM cast is great! Colette, what's your favourite Criminal Minds episode? So I would say Demonology and just a very little behind Omnivore. I have to go, we will talk tomorrow! Suu, if you are around, have you seen the new promo for next weeks episode? Hey Suu, how are you? Have you seen the preview for this weeks episode? Have you read what I wrote on the Bones Fangirls Forum? I haven't been here for the last couple days so that's why I didn't answer you. Hopefully you are feeling better soon! About the preview from this week, I have the feeling that, that woman at the end of the preview, looks like the one from Bloodline, the romanian one. But maybe i'm mistaken. I read your comment on the video with the promo for the new episode and well, you're right, it looks like her! LOL! I was kind of hoping you'd forget that question because it's hard for me to pick a favourite one! One of my favourite ones! Oh, and I would really like to see another scene with the girls like that one in the "Open Season" episode with Brad "the real FBI agent". That has got to be one of the best scenes ever! Colette, I have to go take my medication & then I think I'm going to head to bed. My head is killing me! It was nice to talk to you too, Suu. Aaaaaw, yes thats good night in dutch! Thanks! You know, I watched some old epis from Season 2, tonight too. So funny to see those again. As I wrote before, I saw the Bar scene again, were the whole team enjoyed the evening, it was so great to see them all having fun! :D Hopefully they will do this again. Yes, it is. Besides, I'm working 3 days at an Office and I also have to do my work at Home too. (cleaning, laundry etc.) And raising my daughter. That all needs time and is sometimes tiering. Yes, it's so hard sometimes to find time for everything that needs to be done, both at work and at home - and with a kid! How old is she, btw? My daughter is 4 years old. :) She's my little sunshine, and sometimes my little witch too. ;) Its great to be a mum, but I also love to work at the office. So, I can do both that I like. Yes, I love it here, its always a lot of fun! :) And I can share things with other people who likes the same as I do. They had indeed a really difficult year, and I hope they can spend some time together and have fun. Yes, for me they are like a family. :) They are really great together! So, I really have to go. Have a good night Helga, and sleep well! Have a good night, Colette! It was great talking to you again! Hey Suu, how are you today? I'm a little better than yesterday but my throat and my my head still hurt along with my neck & ears... And watching the new episode of Bones didn't help either because I laughed so much to the point that it hurt! I wish I could stay in bed but I can't miss school. Anyway, I'm feeling a lot better. Let's see how I'll be tomorrow. Oh wait, this is the CM forum not the Bones forum! Ok, so lets talk about CM. You know, Kirsten is left- handed too. I just saw it on the screencaps. Never realized it. :D Did you know? I guess it will be a taff one the next episode. Its always more emotional when children are involved. Yeah. I hope we get to see a little more of JJ in the next episode. Since children are involved and she just got Henry..